Welcome to MagnificentFrigatebird.com, where we have a huge selection of original birding and birdwatching t-shirts, hats, journals, bags and more! We have hundreds of unique birding gift ideas, from apparel to art prints and from buttons, stickers and magnets to clocks & electronics. Our birdwatching merchandise selection includes thousands of products made just for birders, birdwatchers and bird lovers. Our designs are available on a range of different products, from unisex apparel, women's apparel, children's apparel, hats & bags,stickers, and much more. Our collection of funny t-shirts for birdwatchers is designed to make you laugh while you enjoy your birding hobby. These funny birding t-shirts and gifts were made just for birdwatchers and bird lovers. Our collection of birding t-shirts, novelties & gifts is designed for birdwatchers of all levels. 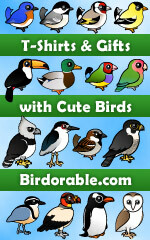 We have cute birding designs, gifts for serious birders and t-shirts for birdwatchers just starting this hobby. These pop culture birding gift ideas are based on movies, tv shows, pop art, music, video games and advertising campaigns. Some of these unique birding t-shirts are spoofs of established designs and others inspired by current events. Unique bird art t-shirts, novelties and gift items. Our bird art collection includes abstract Spoonbill pop art; wild bird photography gifts; stylized bird illustrations; historic bird art by Audubon and others; and stylish Flip Mino camcorders. Back yard birdwatching and feeding the birds is a hobby enjoyed by millions. The excitement of backyard birding can be enjoyed by anyone. Our original back yard birdwatching designs make great gifts for anyone that loves this pleasureable hobby! From birding your local patch to your bird-themed holidays, you'll find original souvenirs and other unique swag to show off where you've been birding! Travel abroad or across the street, show it off! State birder designs for every state plus local specialties. Many birders like to keep a list of the birds they have seen in their lifetime - a life list. These medallion-style designs commemorate lifelist milestones. Remember that special achievement! Proud birder? Safe driver? Warn others that you're stopping for the birds with these birder bumper stickers and birdwatcher license plate frames. Fun, original designs based on bird ringing, also called bird banding. Birds are banded for research purposes. This collection of designs is made just for bird ringers or bird banders.